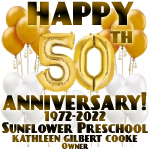 Welcome to Sunflower Preschool's Website! Sunflower Preschool Ltd. in addition to its own curriculum is pleased to offer programs through independent contracts for an additional fee. These would include; Kiddin" Around and The Little Star Dancers. The Little Star Dancers Program is a 30 minute class designed for children ages 2-6. Louise Merchant, owner and teacher, began her program 9 years ago. In this dance class your child will learn to move, create shapes with his/her body, and pantomime using proper technique that is developmentally age-appropriate. Some printable documents on our site may require you to download and install Adobe Reader. Please feel free to contact us with any questions or comments or for a tour of our facility. Copyright 2011 Sunflower Preschool all rights reserved.